Fifty years is a very long time, is it not? Actually, I can only imagine how it feels because your book, The Phantom Tollbooth (Knopf, 2011), which is celebrating its 50th anniversary, was birthed a few years before I. And that’s where some embarrassment sets in for me. Although the book was always in the library during my growing-up years, and though other kids gave oral reports in elementary school and it was highly recommended by librarians, I never read it until just now. You see, Mr. Juster, I was a rather persnickety child who literally judged a book by its cover. True! Certainly, no book was worth reading if it had the word “tollbooth” in the title. My parents drove me through tollbooths twice a day and I knew them to be dirty, congested, panic-inducing (“Look under the floor mats for more change!”) harbingers of tardy slips and detentions. And what's up with that dog/clock thing? So for years I took a pass on your book. Sorry. Today, I comprehend the extent of my former foolishness. Why, reading The Phantom Tollbooth reminds me of many wonderful books I’ve enjoyed through the years such as the Book of Nonsense by Edward Lear, John Bunyan’s Pilgrim’s Progress, and Lewis Carroll’s Alice’s Adventures In Wonderland. And it makes me remember my formerly childish self. Your main character is a boy named Milo who “didn’t know what to do with himself – not just sometimes, but always ... Nothing really interested him – least of all the things that should have.” Well, that’s just like sixth-grade me. The sighing Milo passes through a mysterious tollbooth and finds himself in a place called Expectations. There he meets the first of many peculiar characters he will encounter. Mr. Juster, I think you got the idea for some of these idiosyncratic beings from my own family. In his travels, Milo learns the history of the kingdom of Wisdom and its two great cities: Dictionopolis (the city of words) and Digitopolis (the city of numbers). The princesses Rhyme and Reason kept these two cities in harmony until they were banished, causing Wisdom to fall into disrepair. To restore Rhyme and Reason, Milo must jump to Conclusions, swim the Sea of Knowledge and face the forbidding Mountains of Ignorance where dwell demons such as the Threadbare Excuse, the Gross Exaggeration and the Overbearing Know-it-all. An impossible task, yes, but Milo can do it simply because he WILL do it. 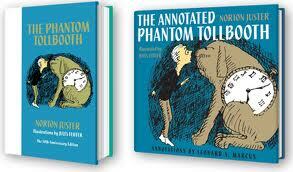 Mr. Juster, The Phantom Tollbooth is brilliant and nonsensical, playful and logical. Your frolicsome treatment of conventional idioms leaves me feeling like I am having tea with the Mad Hatter. This “linguistic mayhem,” as you once called it, is utterly delightful to clever children and astute adults alike. What fun! Your fable brims with delightful morsels of wisdom and sagacious lessons to be thought about over the journey of a lifetime. I feel a little younger and a little smarter, too, for having read your book. Happy 50th anniversary, Milo, Humbug and Tock! Sorry I’m so late in coming to the party. P. S. Mr. Juster, your new picture book for kids ages 4-8, Neville (Schwartz & Wade, 2011) is marvelous, too. The mixed media illustrations by G. Brian Karas perfectly capture the changing emotional tone of your story. It opens on a lonely boy in a colorless neighborhood. His back is to the reader and he gazes into nothingness as a moving van leaves the scene. 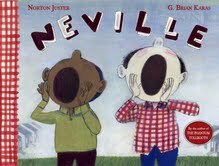 Lonely and sad, the boy walks a little way then takes a deep breath and shouts the name “Neville” into the air. Shortly another boy joins him and advises him to shout louder because “he probably can’t hear you.” They shout together. More children join them and take up the call. With each child comes a little more color and life doesn’t look so bad anymore for this young man. The charming ending came as a complete surprise to my youngest son. Now he’s a Juster fan, too. 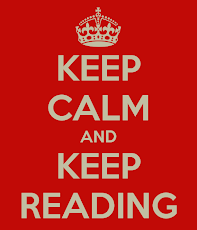 Juster’s Phantom Tollbooth reminded me of several classics that you might enjoy, some of which were mentioned above. 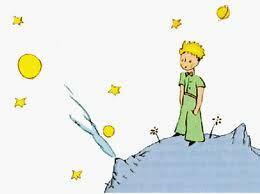 Another timeless book for the whole family is The Little Prince (Harcourt, 1943), by Antoine De Saint-Exupery. Saint-Exupery’s classic story is another book that grows with the reader. A child hearing the story will have a very different impression than a teen reader, and an adult’s understanding will be different still. A narrator recalls the events of six years before when he, a pilot, was stranded in the desert. He wakes to find a surprising little boy standing before him, asking for a drawing of a sheep. This little prince from asteroid B-612 finds the ways of grown-ups to be very strange, for grown-ups, it seems, tend to be rather selfish, narrow-minded and lacking in imagination. The bittersweet parable was written in French. Katherine Woods’ translation has been the standard in English until recently, and it may be difficult to get a copy, but it is worth the try. Richard Howard’s omnipresent new translation from 2000 is adequate, but lacking the lyrical tenderness of Woods’ work.